Are you tired of being disorganized? Being a finish carpenter, I sometimes find it hard to keep track of all my hand tools. I have tried many types of bags, but none seem to work. They just don't seem to have enough pockets, or they are so small you cant fit some of your larger tools. If you find you have the same problems as me, VETO PRO PAC Tool Bags might just be what you are looking for. They have 2 different styles of bags, with 3 sizes for each style. 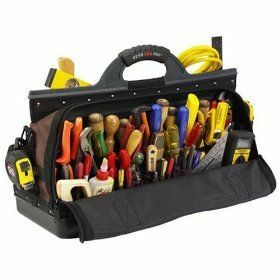 They have the open top bag, so you have fast easy access to your tools, and the original closed top bag, that keeps your tools safe and secure during transport. The 3 sizes they offer will be sure to fit your hand tool needs, big or really big. If I was going to choose a bag, and money was no issue, I would probably get the XXL-F closed top bag for the simple reason that it can carry a 2 foot level and other longer hand tools. I said if money was no issue, because these bags are not cheap. Their cheapest bag will cost you $110 on Amazon; but then I have never seen any other bag come with a 5 year warranty. You need to weigh the quality vs the price.